Holy Communion | The Old Adam Lives! The treasure of the Church is the good news that God was in Christ reconciling the world to himself. Christ is the living Lord of his Church. He alone is our Great High Priest. 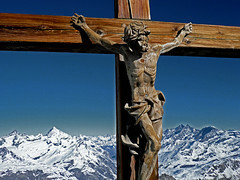 Because he has done all that is necessary on the cross, we have no further need for priests. He is the sole Mediator (1 Tim 2:5). He is living today and comes to us through the means of Word and sacrament. 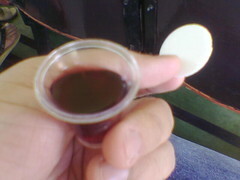 The Lord’s Supper is a sacrament, that is, a gift from God to us. It is not essentially an act or rite in which we give something to God. Therefore we do not use the term “Eucharist,” which means “Thanksgiving.” This term is commonly used by those who regard the sacrament as the church’s sacrificial offering, through the action of a sacramental priest, to God. In his Supper, our Lord gives his last will and testament to us, his heirs – promised forgiveness of sin (Heb 9:15-22) and life. The Words of Institution are God’s address to us; therefore the appropriate form for them is a free-standing proclamation to us, his heirs, and not buried within a “eucharistic prayer” offered by the pastor/priest to God. 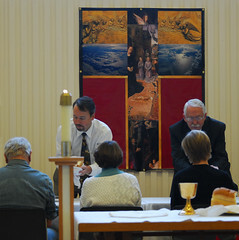 For the sake of good order our pastor administers the sacrament. However, we also allow appointed lay leaders to serve in this role when needed. We are free to adopt this practice because all the power of the sacrament is in the Word alone: “The gospel is the power of God for salvation” (Rom 1:16). Thanks to CrossAlone for this article. Thanks to ‘Waiting For The Word’, for the photo. Isaiah warned us and Jesus repeated it – it’s hypocritical to honour the Lord with your lips while your heart is far from Him (Isaiah 29:13; Mark 15:8). It’s something I pray about every Sunday, “As I preach or pray or sing, may my lips and my heart be set on the Lord Jesus.” But there’s another danger. We can react the other way and disdain anything ‘external’. We say to the world: “I reject ‘works’, I’m all about the inward life.” And so we’re constantly taking our spiritual temperatures. We neglect ritual (as though it always leads to ritualism). And we start to think of faith as a thing – the one really meritorious work! The faith-works polarity becomes, in our thinking, an internal-external polarity. Internal – good. External – bad. We start to imagine that mental acts are good old grace while physical acts are nasty old law. But that’s not how it is. There can be a crippling legalism of the heart (ever felt it?) and there can be a wonderful liberation in gospel rituals (ever experienced that?). Take communion. Please. No but seriously, take it. Because here is a gospel ritual which, because it is external, brings home the grace of Jesus all the stronger. We are not (or at least we should not be!) memorialists. Jesus has not left us a mental duty with the bread and wine as mere thought prompters. We have been left a meal. To chew. And to gulp down. There are motions to go through. And they are the same motions we performed last week. And the week before that. But here’s the thing – these motions are means of God’s grace and not in spite of their externalism but because they are external. Here is a gift that comes to you from outside yourself. And it comes apart from your internal state. But nonetheless it is for you – sinner that you are. So take it regardless of whether your heart is white-hot with religious zeal. Take it regardless of whether you are really, really mindful of the gravity of it all. And as the minister prays the prayer of consecration and your mind wanders… oh well. Don’t ask him to start again. Go through the motions I say. Your heart is meant to catch up with the motions. That’s why the motions were given. Because our hearts are weak and not to be trusted. So allow the Word to come to you from beyond. Allow Him to love you first. Don’t disdain ‘going through the motions.’ For many on a Sunday – those grieving or sick or gripped by depression – they need to be carried along by these motions. And for all of us – if we’re going to be people of grace, we need these externals. You are another non-Lutheran who gets it. Not going to receive any special instructions. Not going to find out any secrets for spiritual living. Not going to get prodded with the stick of how I should be feeding the poor and helping the sick, and visiting the lonely…(all of which I should be doing). I am going to receive the Word of God. I am going to (by the grace of God) receive from Him His law, in order to kill me off yet once again to my little ‘No thank you God I can do it myself ‘ project. And then recieve from Him His promise of life, the forgiveness of my sins, my salvation…in the gospel, and in the body and blood of our Dear Lord who has poured out Himself for me (us)…which is pure gospel (no law). This is a picture of baptism, by the way. Death and Resurrection. Repentance and Forgiveness. Dying and Rising. OK. Jesus said it. He says “truly, truly…” before he says it. Do you really think it is quite as serious as that? Or are we making too much of this command?